Want to start learning to fly? Kite buggies are three wheeled carts for traction kiting. These are a way to harness the wind to pull you along at speed! We do a full range of buggies and spare parts for them, from basic recreational buggies to full race buggy and everything in between. 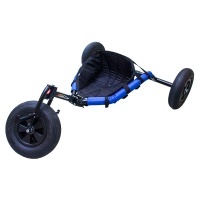 All the buggies we stock are good quality and solid construction not cheap copies and are available with spares and support. The Rally by Peter Lynn is the evolution of the XR+ and takes the same geometry and is full stainless steel. Comfortable padded seat makes it ideal for beginners and progression. The Rally by Peter Lynn is the evolution of the XR+ and takes the same geometry but is made from galvanised powder coated steel. Comfortable padded seat makes it ideal for beginners and progression.